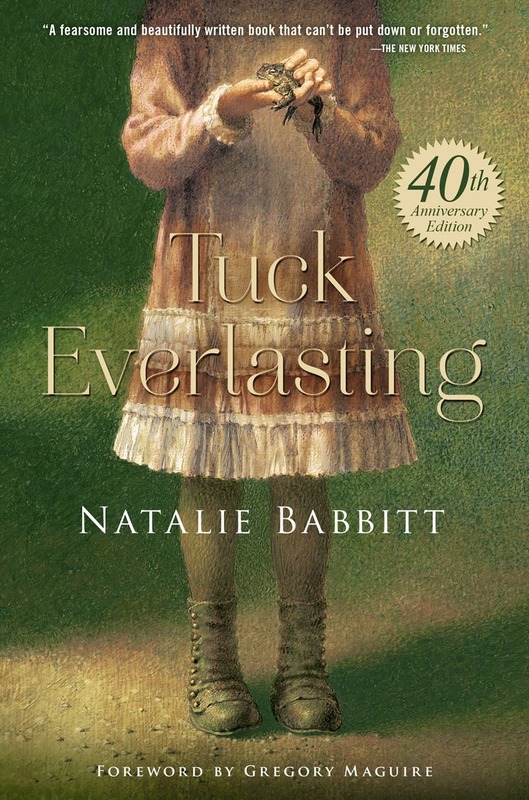 2015 marks the 40th anniversary of Natalie Babbitt’s celebrated, ground-breaking title Tuck Everlasting (Anniversary edition on sale January 20). In celebration of the anniversary, Macmillan Children’s Publishing Group will publish a special anniversary edition featuring an introduction from Wicked author Gregory Maguire. What if I could live forever? I read Tuck Everlasting for the first time this year. I know, it seems like some kind of travesty never to have read this book, but it wasn't ever school reading and during my days aimlessly browsing the library I never came across it. I now want to make it my personal mission for elementary and middle schoolers to read this novel! Tuck Everlasting handles death in a manner that is easy to understand and makes seriously tough subject matter seem simple. I loved that each character represented a decision and that the author left it to Winnie to decide for herself if she wanted to drink from the spring and live forever or if she wanted to live her life naturally. One of the philosophical questions in Tuck Everlasting is if you could live forever would you? And my answer to that is no. Mr. Tuck does a great job explaining this to Winnie, there is a natural order to things; you are born, you live, and you die. If everyone got to live forever there would be too many people and we'd all be living atop one another. If I knew about the spring I wouldn't drink from it, after all forever is an awful long time. No, I would not want to live forever. If this world wasn't filled with such hate, I probably would have. Maybe in a different world I would. I can't see myself living forever in these times. No way I woukdnt wants o outlive my child. If I didn't have him he's I could just ice myself over but he's the only reason. This is one of the best books ever. I wouldn't drink from the spring though. That's a scary thought. I think I would, especially if I got to stay young forever.